Former English Defence League (EDL) leader Tommy Robinson has been jailed for potentially prejudicing a court case, it can be reported. 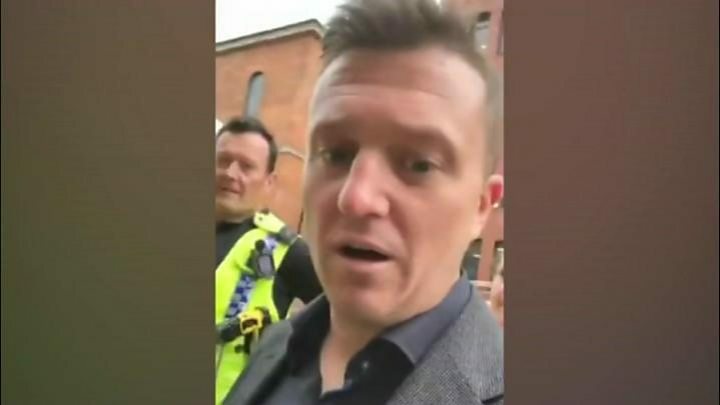 Robinson, who appeared in the dock under real name Stephen Yaxley-Lennon, was arrested in Leeds on Friday. The 35-year-old was broadcasting on social media outside the city's crown court where a trial was ongoing. A ban on reporting his 13-month sentence at the same court was lifted after being challenged by the media. Robinson, from Bedfordshire, was found guilty of a charge of contempt of court. A judge told him his actions could cause the ongoing trial to be re-run, costing "hundreds and hundreds of thousands of pounds". In footage which was played to the court on Friday, Robinson was seen filming himself and people involved in the trial. During Friday's hearing, Matthew Harding, defending, claimed that his client had "deep regret" for what he had done. "He was mindful, having spoken to others and taken advice, not to say things that he thought would actually prejudice these proceedings," Mr Harding said. Judge Geoffrey Marson QC said: "Not only was it a very long video, but I regard it as a serious aggravating feature that he was encouraging others to share it and it had been shared widely. "That is the nature of the contempt." Why contempt of court matters? Contempt of court is the crime of ignoring the court and its constitutional role in making sure that justice is done. Judge Geoffrey Marson QC initially imposed restrictions for fear that reporting his arrest would prejudice an ongoing trial. Following the arrest there were protests outside Downing Street over the weekend. It became known for its street marches and demonstrations in towns and cities before he quit the group in 2013. Update 29 November 2018: This article has been amended to remove a reference to Tommy Robinson pleading guilty to a charge of contempt of court.